As the crew of Insight Observatory works on getting the Astronomical Telescope for Educational Outreach (ATEO) ready for first light in 2017, it is now time to start compiling databases of deep-sky images as well as designing a curriculum for teaching deep-sky imaging using remote robotic telescopes. As the Insight Observatory deep-sky image database accumulates, it will be available for educational purposes as well as material for software publications. 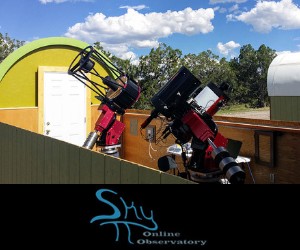 Seeing that the ATEO will be hosted in the mountains of New Mexico, we thought it would be a good idea to start the deep-sky image database using the remote robotic telescopes on the iTelescope network hosted at their Mayhill, New Mexico facility. Their dark-sky site is very comparable to the site the ATEO will be hosted at the SkyPi Remote Observatory located in Pie Town, New Mexico. M81 (left) and M82 (right) imaged on T20 by Insight Observatory. On the morning of November 10, 2016, we compiled raw data of the galaxy pair of M81 and M82 located in the constellation of Ursa Major. The two objects were nearly perfectly placed at the meridian when the images were acquired. The telescope system that was used is known as T20 on the iTelescope network. The instrument is very wide field telescope, typically used for wide field RGB / Narrowband Imaging, but also carries a Photometric V filter. T20 is a great platform for wide angle imaging and can also do valuable scientific research with its photometric V filter. This small Takahashi FSQ could also serve as a tool for scanning for asteroids and working on variable stars. Nothing can match its very wide field portraits and its performance on the sky's larger extended objects such as large nebula, clusters, bright comets and even catching fast-moving Near Earth Objects. After the raw data was taken on T20, it was then stacked and processed using a CCD imaging software package called PixInsight. The images of M81 and M82 that were stacked consisted of five Luminance (clear) images at 300 seconds, four Red filtered images at 180 seconds, four Green filtered images at 180 seconds and four Blue filtered images at 180 seconds. 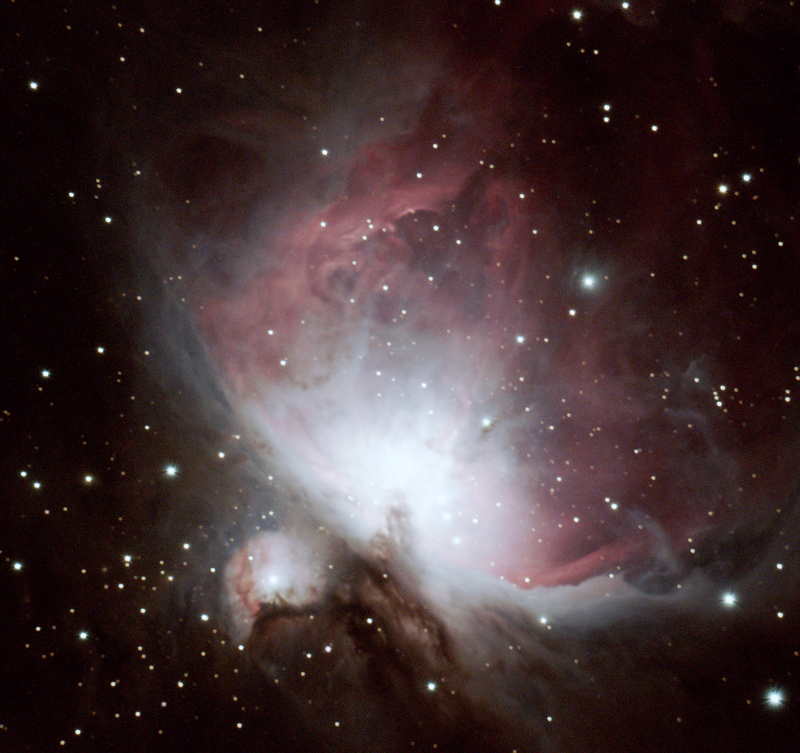 After the images were processed in PixInsight, the final image was then post-processed using Photoshop CS6. Messier 81 was first discovered by Johann Elert Bode on December 31, 1774. Consequently, the galaxy is sometimes referred to as "Bode's Galaxy". In 1779, Pierre Méchain and Charles Messier reidentified Bode's object, which was subsequently listed in the Messier Catalogue. Only one supernova has been detected in Messier 81. The supernova, named SN 1993J, was discovered on 28 March 1993 by F. Garcia in Spain. At the time, it was the second brightest supernova observed in the 20th century. Messier 81 is located approximately 10° northwest of Alpha Ursae Majoris along with several other galaxies in the Messier 81 Group. 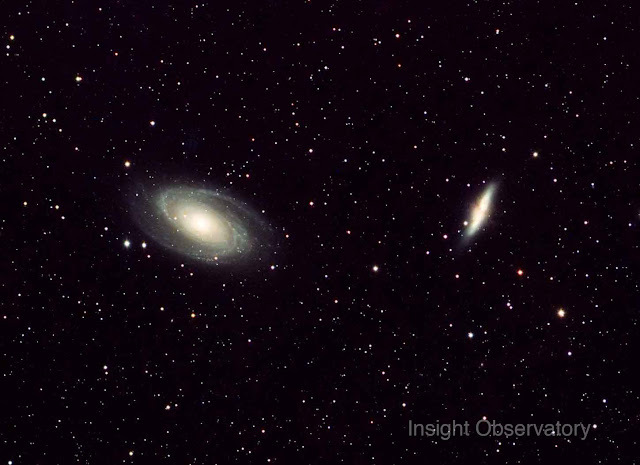 Messier 81 and Messier 82 can both be viewed easily using binoculars and small telescopes. The two objects are generally not observable to the unaided eye, although highly experienced amateur astronomers may be able to see Messier 81 under exceptional observing conditions with a very dark sky. Telescopes with apertures of 8 inches (20 cm) or larger are needed to distinguish structures in the galaxy. Its far northern declination makes it generally visible for observers in the northern hemisphere. It is not visible to most observers in the southern hemisphere, except those in a narrow latitude range immediately south of the equator. Messier 82 (also known as NGC 3034, Cigar Galaxy or M82) is a starburst galaxy about 12 million light-years away in the constellation Ursa Major. A member of the M81 Group, it is about five times more luminous than the whole Milky Way and has a center one hundred times more luminous than our galaxy's center. The starburst activity is thought to have been triggered by interaction with neighboring galaxy M81. As the closest starburst galaxy to our own, M82 is the prototypical example of this galaxy type. SN 2014J, a type Ia supernova, was discovered in the galaxy on January 21, 2014. In 2014, in studying M82, scientists discovered the brightest pulsar yet known, designated M82 X-2. Messier 82 was previously believed to be an irregular galaxy. In 2005, however, two symmetric spiral arms were discovered in near-infrared (NIR) images of M82. The arms were detected by subtracting an axisymmetric exponential disk from the NIR images. Even though the arms were detected in NIR images, they are bluer than the disk. The arms were previously missed due to M82's high disk surface brightness, our nearly edge-on view of this galaxy (~80°), and obscuration by a complex network of dusty filaments in its optical images. These arms emanate from the ends of the NIR bar and can be followed for the length of 3 disc scales. Assuming that the northern part of M82 is nearer to us, as most of the literature does, the observed sense of rotation implies trailing arms.